Factory painting or commercial painting has it’s own set of challenges. Quality workmanship is of course the objective but other considerations must be taken into account. Safety is always of greater concern. The work conditions are often a challenge. Speed and strange work hours must always take a second seat to safety. Often machinery and equipment are still operational while improvements are taking place. 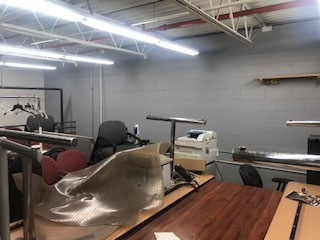 We recently had a job that was not only operational but they were also in the process of moving locations so there was a lot of equipment being moved and an endless number of people coming and going to get things moved. In this situation it’s best to bite the bullet and pick work hours that will have the fewest people and activity going on. There was a deadline to be vacated from the property by the end of the month so that made it a greater challenge. On any project it is best to have realistic expectations and meet objectives in small slices rather then get rushed and create a bigger problem because of pressure. Disasters can occur. 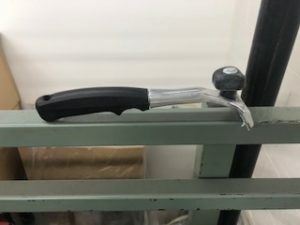 On a factory painting or commercial job the likelihood of a problem is greater but problems can occur on any scale job when speed overrides common sense. On an upscale residential job a homeowner decided to do some work of his own while we were working on his home. I don’t know if the motivation was speed or an attempt to save money but it ended up costing a lot to correct the mistake. He dropped a staging platform of a Granite counter top and destroyed it. 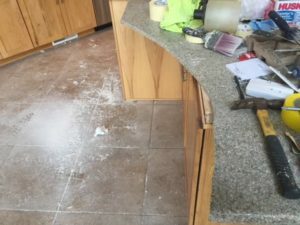 We certainly could have done the work and it would have cost much less then new counter tops. A steady, well planned approach is always the best course of action on improvement projects. All paint has an odor associated with it. Solvent based products have a strong smell and even latex paint will have an odor; just not as strong. What we are discussing is paint that just smells awful. I have had people often ask me why paint sometimes smells like bad milk. On commercial job-sites I have employees bring smelly paint to my attention and think someone has urinated into open five gallon buckets of paint. Which does happen believe it or not. The culprit is bacteria. Just like with milk, bacteria will grow in a latex product and produce a strong odor. This normally happens in an older open can of paint but can also occur in any open can where bacteria can get introduced and grow. Smelly paint is often an indication of bacteria growth. In solvent based products this is not a problem because the solvents kills bacteria. You can sometimes use the product if there is no visible growth or mold but my suggestion is to get rid of it. It is possible to transfer that odor to what you are painting even if the paint appears to be good in all other respects. If you have already applied a latex product that has an odor to it and it appears sound in all other respects, the fix is to apply a sealer. Preferably a solvent based one and repaint. I would suggest tinting the sealer to your finish coat to make coverage easier when you repaint. 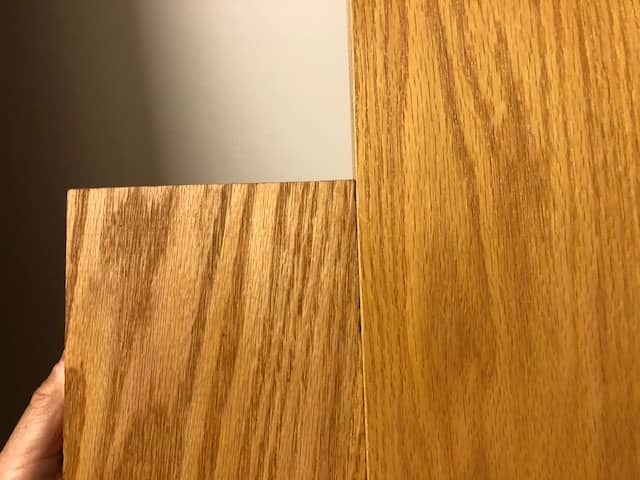 Door staining is not difficult with a little know how and the right tools. Not surprisingly the most important component is the stain. There are the big box store stains and the stains available from paint stores. Even among paint stores there are some that are garbage. I like Gemini stains and prefer to use them when possible. There are some others that are good as well. I’ve previously discussed the different types of stain and for theses doors, pictured below, I used a mineral spirit based wiping stain. Besides the stain you will need a good area to work in with good ventilation. 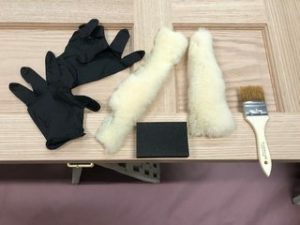 Sand paper or sanding sponges, gloves, rags, a few throw away brushes and I like to apply my stain with sheepskin scraps. 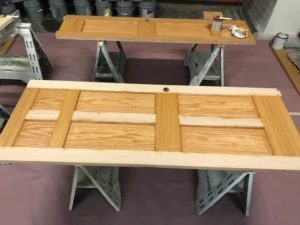 Once you have your work area picked out and the floor protected you will want to lightly sand the doors. I normally use about 120 grit paper. Then wipe them down with a clean rag. 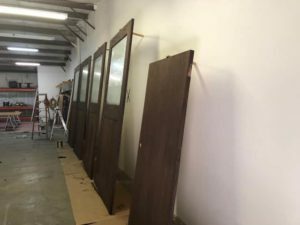 On raised panel doors I like to stain the panels first. This is a good area for the brush. To get the stain into all the seams around the trimmed out areas. I next stain the horizontal panels and then the vertical ones. These doors were made from oak so no pre-treatment or wood conditioner was necessary prior to staining. On softer woods or woods with open grain it is usually a good idea to precondition the wood to make the appearance uniform. I make my own wood conditioner and will discuss that in a future post. There are wood conditioners available for sale if you need one. The appearance of the stain can be adjusted by many means. How long the stain is left on the wood prior to wiping, how it is applied, how much you sand, if you precondition the wood or not, etc. 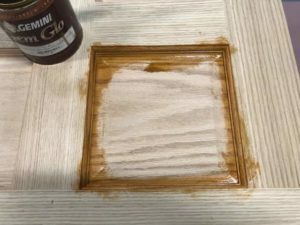 If you stain a door and discover it is not quite what you want, you can darken it by staining again or by “dry brushing” addition stain onto the surface. 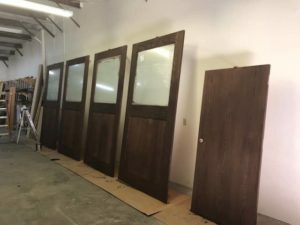 These doors were stained on saw horses. If you need to stain larger doors, a trick is to nail a piece of wood at the top of the door and lean it against a wall. 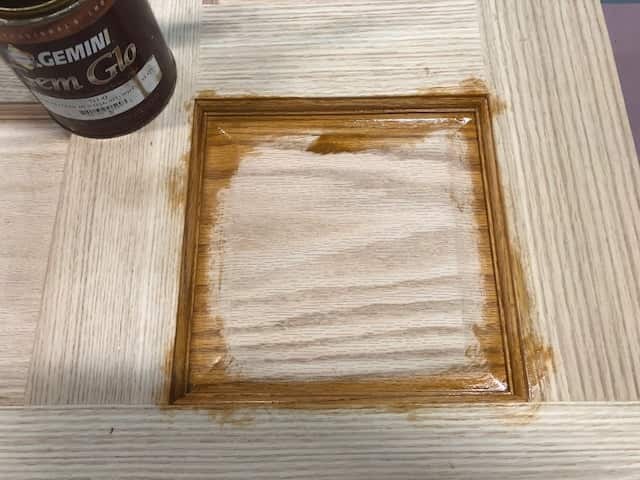 Because you can adjust the look by so many means I recommend first staining a piece of the same type of wood so you know what you need to do when ready for the door or doors. Once the doors are stained you can lightly sand and seal/finish with your preferred finish. 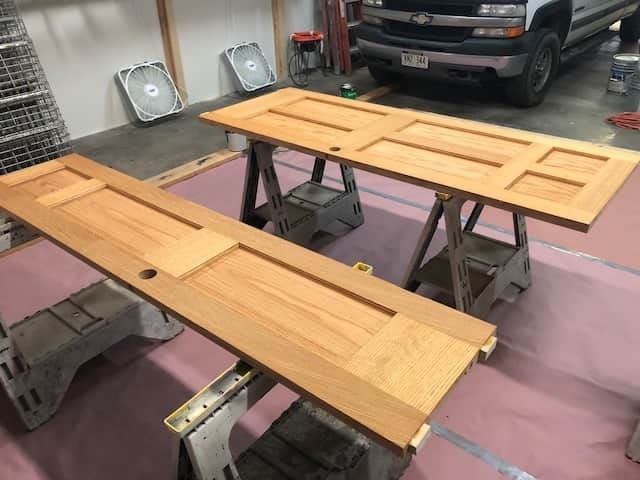 These doors got 3 coats of Pre-Catalyzed lacquer. 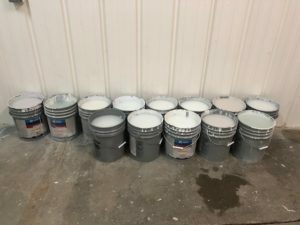 A five gallon bucket is what you are most likely to be getting your paint in for many home painting projects. A bathroom or similar small area you’ll likely get a gallon or two. The vast majority of the paint we purchase is in fives so that brings with it the question of what to do with that bucket when it is empty. One thing is certain, we try to never throw those buckets away. It is worth the time and effort to clean them out. Especially when you consider how long that bucket is going to be sitting in a landfill. We typically go through hundreds in a month so we give them away to schools, daycare centers, etc. A five gallon bucket has so many uses from storage to gardening, etc. No point in going into all the uses for them. There are actually some “books” out there on what you can do with them. Some of them have good ideas and some rather silly ones. The point is that if you had latex paint in that bucket it is very easy to clean out and you should do so. The biggest trick to making the job of cleaning out that bucket easy is to put the lid on it when empty. Wet paint is much easier to remove and clean. If the bucket has dried paint in it we will usually line them up and fill them with water to soften the paint and then into the sink it goes. We pour the water from the dirty bucket into the next one to be cleaned so we don’t waste more water then necessary. A little hot water and a plastic scrubby makes for an easy clean. Efflorescence is something I’ve mentioned before on this website. It is the movement and deposit of salts on masonry surfaces. That movement is because of the presence of water. 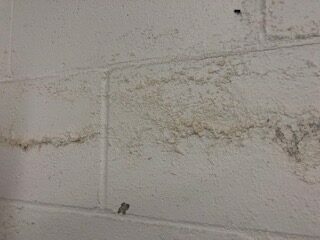 This is the reason that efflorescence is a good indication of having a potential water problem. 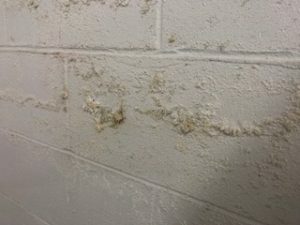 If you discover this on your basement walls, you have water coming through the wall and need to address the source of the problem. Sometimes it is as simple as extending your down spouts away from your home or cleaning out your gutters. We recently had an interior commercial job and discovered this problem. The walls we were working on were high up from the ground. Actually 20 feet up on a second floor; so the source of the problem was a roof issue. It was obvious the issue was old. The walls were dry and we could see the the efflorescence was old. The best way to deal with this is to scrape the surface to remove as much of the efflorescence as possible. I recommend putting something down on the floor to catch as much of the debris as possible. You will also need a shop vac after you are done. The best tool for this is a drag scraper. After the areas are scrapped they should be sealed/primed with a masonry sealer the painted. We used an exterior grade product for some extra kick. Products like drylok are great but a waste of time if the surface has been previously painted. They are only effective on 100% bare surfaces.